There's a bundle of reasons that we like the Nihola. Where to begin, where to begin. 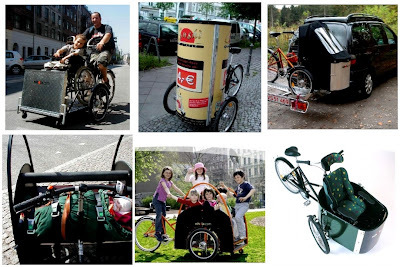 Here in Denmark, the spiritual home of all cargo bikes, there have been a number of classic cargo bikes. We've enjoyed 70 odd years of The Long John. We embraced the The Christania Bike and it's optimistic ideals. Even the Dutch are producing cargo bikes that are selling well. But what we like about the Nihola first of all is the design. So many cargo bikes are square and wooden in nature. The Nihola stands out instantly in the cargo bike crowd. We love the modern lines, the modern, lightweight materials and we love the stylishness. The name is cool, too, sounding all Japanese chic, but it merely stands for Niels Holme Larsen - the mastermind behind the brand. He sought a design alternative to the standard cargo bike look and the Nihola was the result. It continues to win awards for design and safety, as well as ease of riding. It's a versatile bike, with only the imagination setting the limits for usage. The key to the Nihola design is its round transport box, which adds strength, thus reducing the amount of materials needed, and which reduces the overall weight. The round shape also allows the two front wheels to turn around it. This enables a better turning diameter than with a square transport box. Then there is the low centre of gravity, which provides great stability. You can choose the round box or the cigar box, more of an oval. The number of accessories is staggering. Seats and seatbelts for kids, a door on the front of the box, bike lights, you name it. It's the perfect urban transport for any city. Room for groceries and kids and pets. Another thing we like is that the company is versatile with their own design. Apart from their Standard Cigar family designs, they have developed a slough of variations. The mosaic above shows some of them off. The Nihola Flex - for transporting wheelchairs. The Nihola Posterbike - for urban poster putter-upping - although it says on their Danish website that they can deliver it with a draught beer keg system instead. Immense idea. The Nihola car rack for transporting your bike if need be. 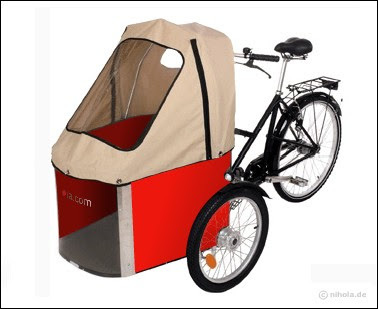 The Nihola Big - a king-size version designed for kindergartens or any transport of precious cargo. The Nihola Rehab - for transporting disabled persons. What's more, the Nihola is smoooooth to ride. The wheels turn under the cargo box, unlike other brands in which the cargo box swings with you. We like that stability. Nihola is based in Copenhagen, and their bikes are produced here, too. If you're in town, visit their showroom/workshop near the city centre. It's inspirational. Nihola's Danish site - which has for some reason much more stats and specs.